Wine bars put a new spin on wine tasting by providing a casual, relaxed atmosphere. Whether you are wanting a quiet corner of the world for a romantic date or a long talk with friends, a wine bar is the perfect spot! Order an appetizer and linger while you sip some flavors of the finest wines from around the world. Thankfully, we have several wine bars to choose from here in Indy. Here are a few of our favorites that you might not even know existed. 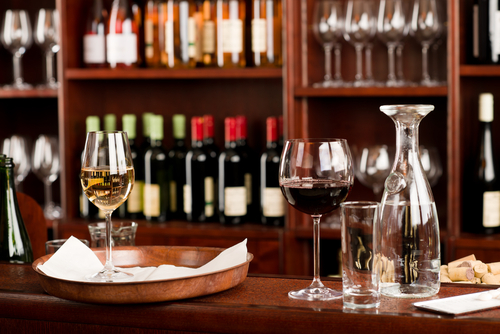 With over 200 wines in stock, Tastings offers the entire selection by the taste, by the glass and by the bottle. Every bottle is sold at retail price and can be opened in the store or taken home to enjoy. They also have an extensive selection of spirits and craft beers in their full service bar and delectable food to enjoy while you drink. Corner Wine Bar offers an award-winning wine list and an outstanding bistro-style menu. With innovative offerings featuring Certified Angus Beef and fresh seafood, there's something for everyone. Set in a charming turn of the century building in Broad Ripple, Corner Wine Bar is also noted as one of Indy's most romantic spots. Mass Ave Wine Bar has 100 wines $15 and under, and the bottles they have priced higher are because they truly believe they are worth it. If wine isn't your thing, they alo offer a variety of bottled beer and unique spirits and liqueurs. Enjoy small plates and sweet treats at the cafe while you drink. Shiraz Wine Experience and Art Cafe paints itself as a playground where lovers come to escape, friends come to relax, and the wine curious come to experience the newest wines from all over the world. Shiraz features self-serve, state-of-the-art wine tasting machines that allow guests to explore boutique wines at their own pace - with 1, 3, or 6 ounce portions. If you're a wine connoisseur, put these four wine bars on your calendar today. What are your favorite wine bars in the area? Let us know in the comments below!